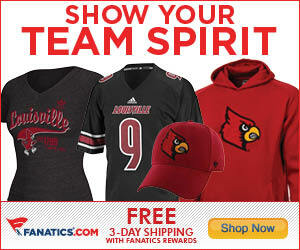 College Colors Day: Beth wears U of L Red and Black! Through my allegiance to UofL, I have experienced the jubilation and disappointment of great victories and painful losses. One of those losses came on the gridiron in the fall 2006 against Rutgers University. Had Louisville played better that evening, I might have met my husband, Bart, as we were watching the game with mutual friends. As chance would have it, we would cross paths again in 2007 (thanks again to our mutual friends) the evening of the UofL/UK game. UofL lost the game; which made me give second thought about going on a date with a UK fan I met that evening. One of the greatest triumphs was watching the Cardinals win their National Championship game in 2013 with my Dad on his 70th birthday (even more meaningful as he passed from brain cancer a year later). The National Championship game is just one of many cherished memories of watching UofL play through the years with my family. And while always a UofL fan, my dedication to Louisville continues to grow stronger. Our house divided rivalry is a special bond for my husband and me. I think of us as modern day Montagues and Capulets (without the grisly ending!). It is not uncommon to find my little family on Sundays in the spring at Patterson Field watching UofL baseball with our young son who loves running the bases when the game is finished. He loves the “Cardinal Bird School” (but can be heard frequently saying, “Go Big Blues” too). And I am not just a fan of the UofL athletics. I also work for UofL as the Director of International Programs in the College of Business. Furthermore, I will earn my PhD from the University of Louisville and join my Dad in its ranks of alumni. Now when I go home to Danville and other areas of UK strongholds in my youth, I see more and more representation of the University of Louisville. While I know much of the growth in popularity is connected to our athletic successes, I also know the University of Louisville continues to provide a quality education for the students who enroll each year. From football to Fulbright, UofL is a university where great things are happening. As a member of the Louisville community, a student, and a life-long fan I genuinely believe Louisville First, Cardinals Forever #L1C4.